Located on Atwood Lake near Wolcottville. 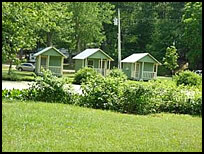 Camping Cabins - Rustic cabins accommodate 2-4 people and consist of one set of twin bunk beds, table and chairs, porch, fire ring, and electricity with a ceiling fan. Water is located nearby. Bring your own linens.